Squad and Platoon Drills. R&S. 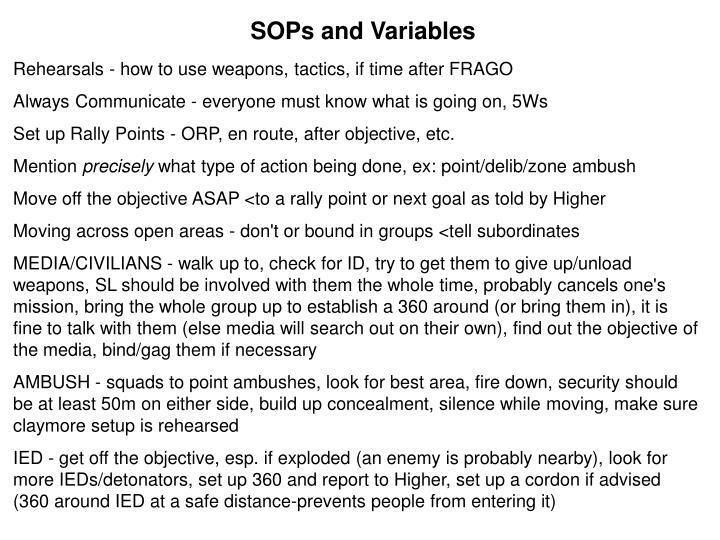 Prior Assault SOPs. Soldiers are prone in 360 security at AA and ORP. They may be kneeling for temporary stops, but such is METT-TC dependent. Each team is assigned half of the 360 (more when members not present), usu. the lead element has 9-12-3. Soldiers are prone in 360 security at AA and ORP. They may be kneeling for temporary stops, but such is METT-TC dependent. Each team is assigned half of the 360 (more when members not present), usu. the lead element has 9-12-3. The Assemby Area in 360 security. Here the orders process is given by Higher to the SL. The TLs conduct PCCs and PCIs. 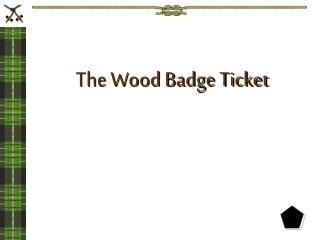 The WARNOs and OPORDS may be given here. TLs disseminate the information to their teams as well as set sectors of fire. If there is no security (the SL will ask Higher/TAC), information will be given to one team at a time while the other holds security. The Objective Rally Point, a second 360 near the target. TLs set lanes of fire. SL sets up recon team, leaves GOTWA to BTL. Use the challenge/password. The BTL gets the rucks set up and holds ORP security. The recon team approaches the target, establishes an R&S point, and SL+TL searches around for good assault & SBF positions. The security team may be planted here if an ambush will be conducted (bring 2 extra squad members for this). The team returns to the ORP. 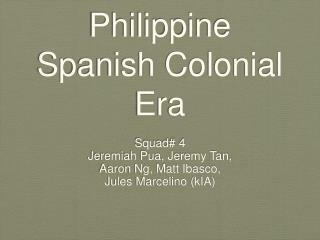 Information is disseminated and the squad moves out to conduct its mission. 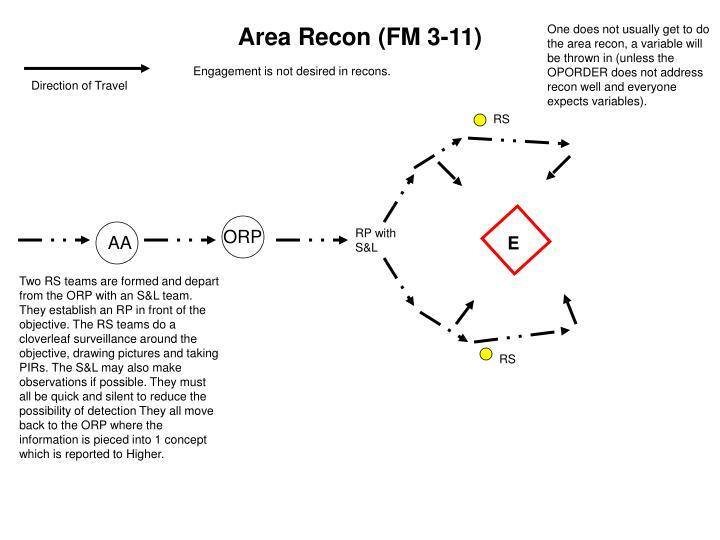 As an alternative, you can have both teams conduct a recon (SL+1) and (TL+1) with a scheduled return. Do not forget to leave a GOTWA at all separations of the squad members. The Line of Departure is not crossed until after Higher approves of the mission. Since the progression between the "fire in the hole ..." sets is quick, you do not need to worry about dissolving half of your security and then the other half as the teams are called off. 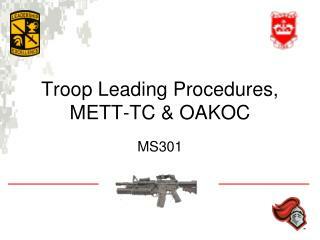 Each group moves in a file to the ORP or RP where 360 is established unless directed by Higher to do otherwise (also depends on where/if rucks are left). It is also possible to move to a new AA for a follow-on mission. The SL will call for shift/lift fire (usu. 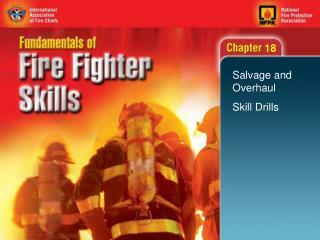 by a time signal or radio) and B shifts/lifts fire so team A can walk across the objective. As an alternative to the L-form attack, one may use bounding overwatch. 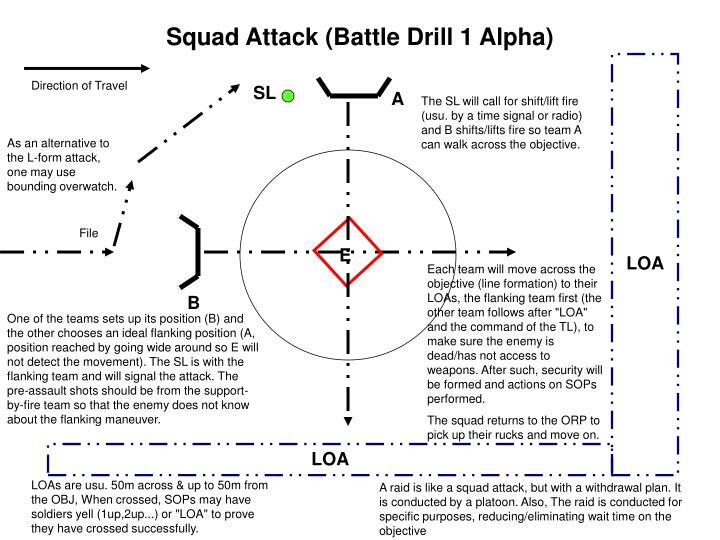 Each team will move across the objective (line formation) to their LOAs, the flanking team first (the other team follows after "LOA" and the command of the TL), to make sure the enemy is dead/has not access to weapons. After such, security will be formed and actions on SOPs performed. The squad returns to the ORP to pick up their rucks and move on. One of the teams sets up its position (B) and the other chooses an ideal flanking position (A, position reached by going wide around so E will not detect the movement). 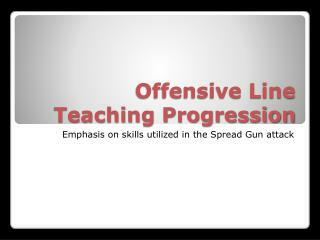 The SL is with the flanking team and will signal the attack. 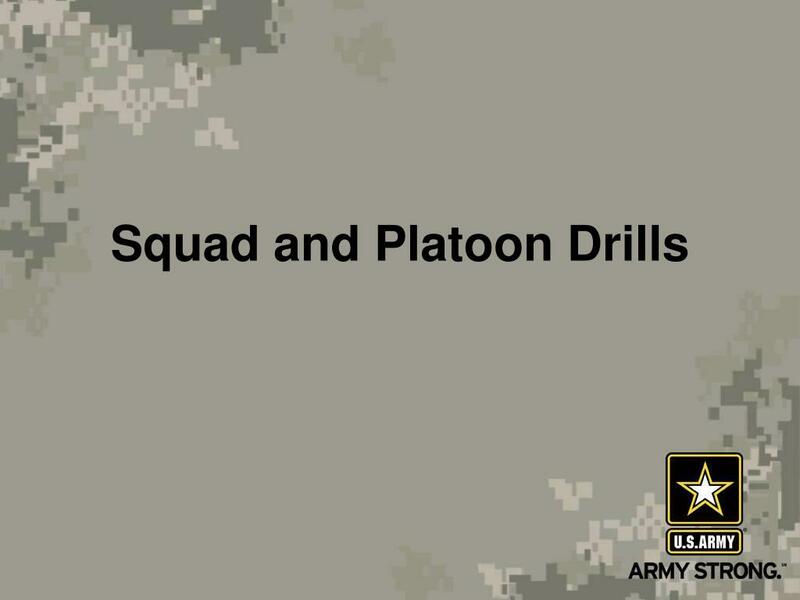 The pre-assault shots should be from the support-by-fire team so that the enemy does not know about the flanking maneuver. LOAs are usu. 50m across & up to 50m from the OBJ, When crossed, SOPs may have soldiers yell (1up,2up...) or "LOA" to prove they have crossed successfully. - The formation moves across the road (stealthily), once reaching the RP, they either stop or slow down so that those behind can catch up. It is advisable that the formation only slow down because staying near an LDA degrades security. The PL should only cross when about half of the formation is across. 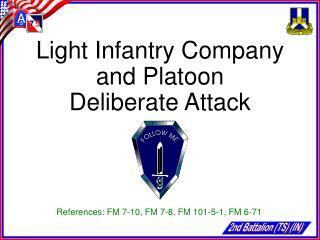 * If one receives contact during LDA crossing, the primary OBJ is to get off it and find cover. One of formation halves may need to hastily cross to regroup/attack, depending on the judgment of the PL. 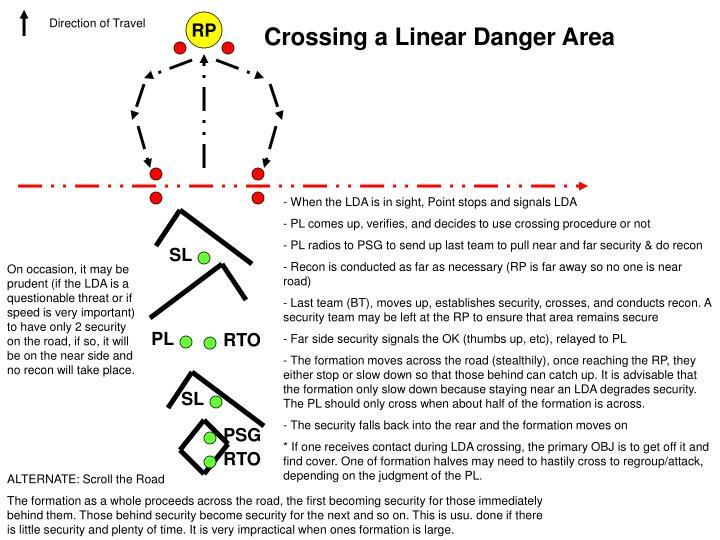 On occasion, it may be prudent (if the LDA is a questionable threat or if speed is very important) to have only 2 security on the road, if so, it will be on the near side and no recon will take place. The formation as a whole proceeds across the road, the first becoming security for those immediately behind them. Those behind security become security for the next and so on. This is usu. done if there is little security and plenty of time. It is very impractical when ones formation is large. 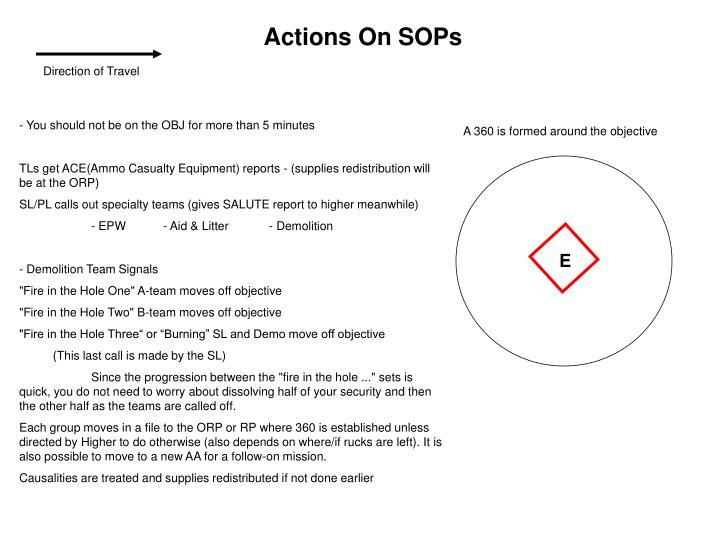 SOPs are used for crossing the objective. The AR of BCT is concealed at the back to shoot any who try to leave the bunker. 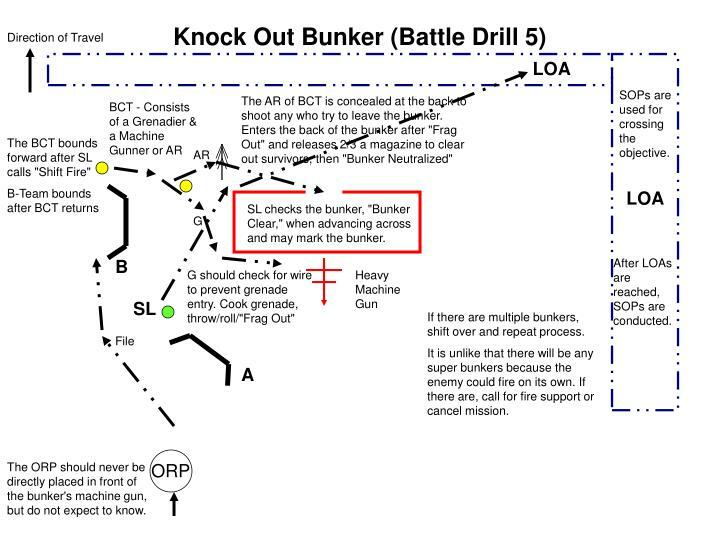 Enters the back of the bunker after "Frag Out" and releases 2/3 a magazine to clear out survivors, then "Bunker Neutralized"
The BCT bounds forward after SL calls "Shift Fire"
SL checks the bunker, "Bunker Clear," when advancing across and may mark the bunker. After LOAs are reached, SOPs are conducted. G should check for wire to prevent grenade entry. Cook grenade, throw/roll/"Frag Out"
If there are multiple bunkers, shift over and repeat process. It is unlike that there will be any super bunkers because the enemy could fire on its own. If there are, call for fire support or cancel mission. The ORP should never be directly placed in front of the bunker's machine gun, but do not expect to know. For a hasty ambush, there are few or no preparations. Set up 360 security after moving through the objective with no one staying in the LDA. Usu. the enemy is following an LDA, linear danger area. If it is an LDA, you will have to pull the enemy off the LDA after grenade checks to finish the EPW inspection. Claymores (usu. 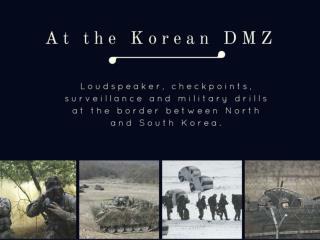 1) are usually used by SL to signal commencement of the ambush. Always test your claymore connection to see if it is working properly. The back-blast of a claymore has a 16 meter kill zone and 100 meter hazard zone. Concertina wire and mines are not usually used in hasty/short notice ambushes. The M16 has an effective range of 350 meters. You do not want to be near the enemy or the claymore. By being back, you have more vision of the kill zone. If you are close, you may not notice the enemy approach so soon and the enemy could more effectively assault you and break your line. Security Teams - set up about 50m from the ambushing teams - they are set up during R&S and will signal when the enemy comes from their side. They do not fire or assault across the OBJ. Use existing cover or set up some yourself. One does not usually get to do the area recon, a variable will be thrown in (unless the OPORDER does not address recon well and everyone expects variables). Engagement is not desired in recons. Two RS teams are formed and depart from the ORP with an S&L team. They establish an RP in front of the objective. The RS teams do a cloverleaf surveillance around the objective, drawing pictures and taking PIRs. The S&L may also make observations if possible. 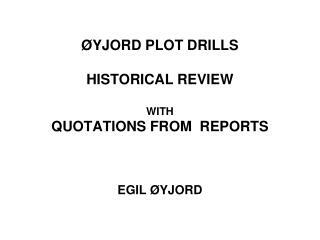 They must all be quick and silent to reduce the possibility of detection They all move back to the ORP where the information is pieced into 1 concept which is reported to Higher. 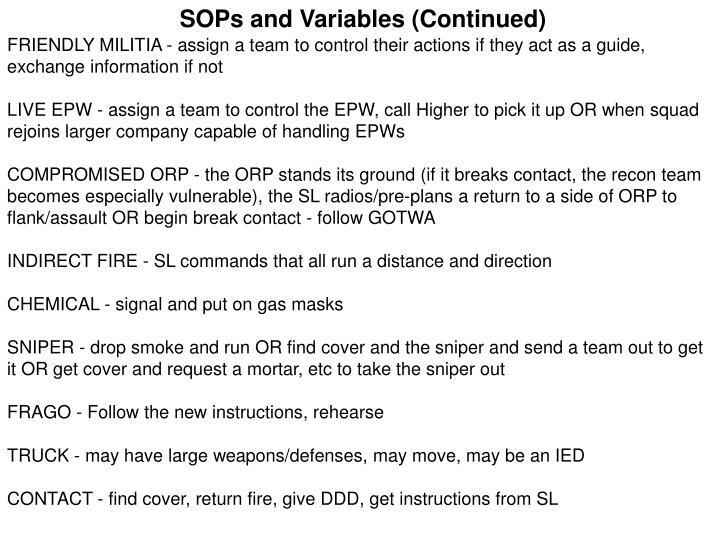 SOPs are used when a visual/shot is made. 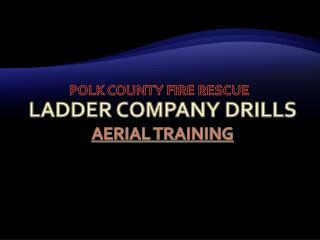 One is usually moving (in wedge/file formation) when RtC occurs. 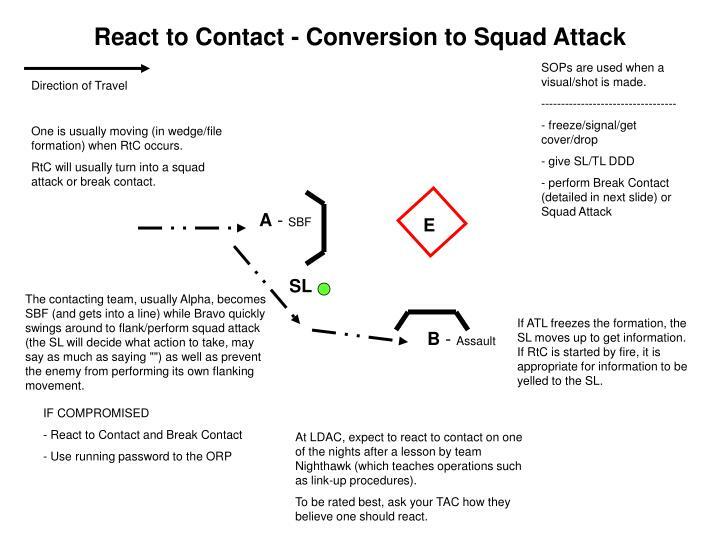 RtC will usually turn into a squad attack or break contact. 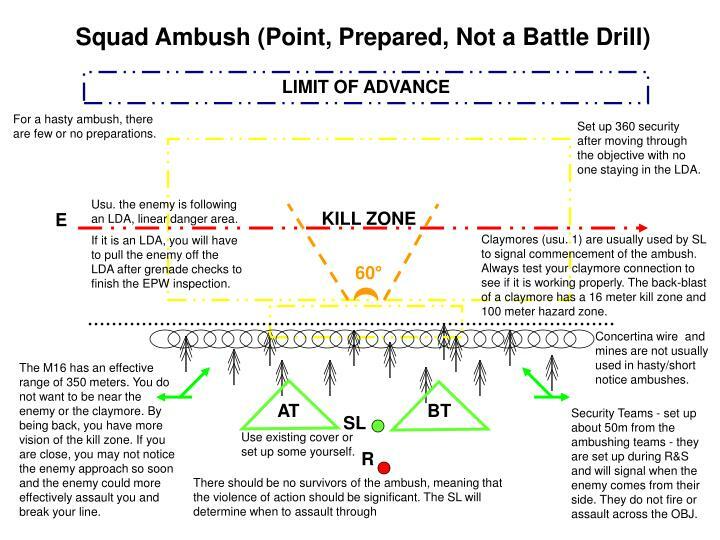 The contacting team, usually Alpha, becomes SBF (and gets into a line) while Bravo quickly swings around to flank/perform squad attack (the SL will decide what action to take, may say as much as saying "") as well as prevent the enemy from performing its own flanking movement. If ATL freezes the formation, the SL moves up to get information. If RtC is started by fire, it is appropriate for information to be yelled to the SL. At LDAC, expect to react to contact on one of the nights after a lesson by team Nighthawk (which teaches operations such as link-up procedures). To be rated best, ask your TAC how they believe one should react. 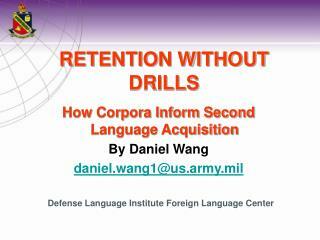 One is usually moving in wedge/file formation (in this case from an ORP) OR when the ORP/RP is assaulted. 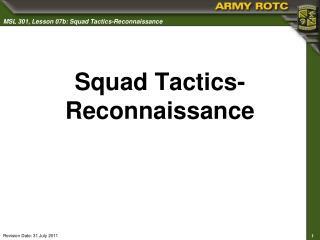 Usually occurs if the squad cannot pass the engagement criteria - the enemy being to numerous, well defended, or well equipped for the risk to be acceptable. - However, one can call Higher for support of some form. 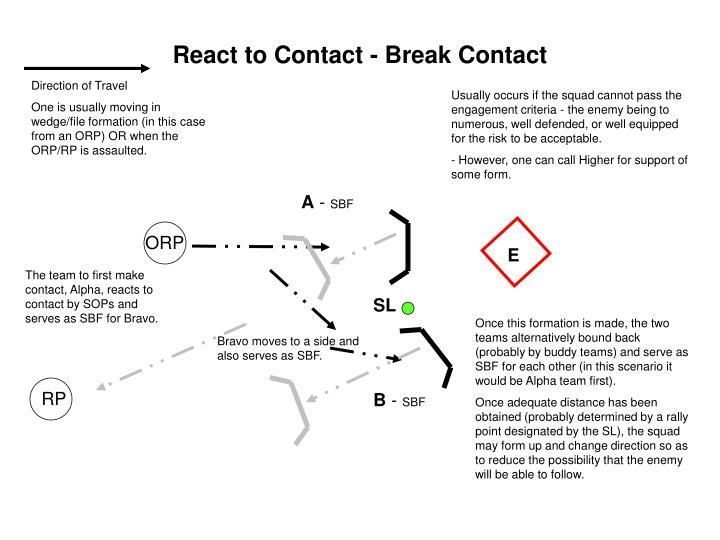 The team to first make contact, Alpha, reacts to contact by SOPs and serves as SBF for Bravo. Once this formation is made, the two teams alternatively bound back (probably by buddy teams) and serve as SBF for each other (in this scenario it would be Alpha team first). 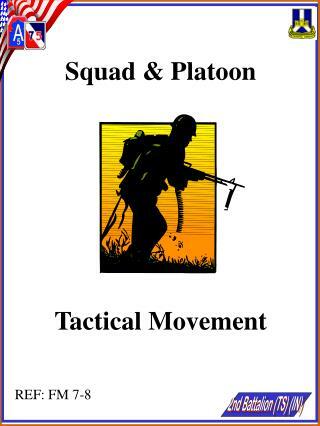 Once adequate distance has been obtained (probably determined by a rally point designated by the SL), the squad may form up and change direction so as to reduce the possibility that the enemy will be able to follow. Bravo moves to a side and also serves as SBF. 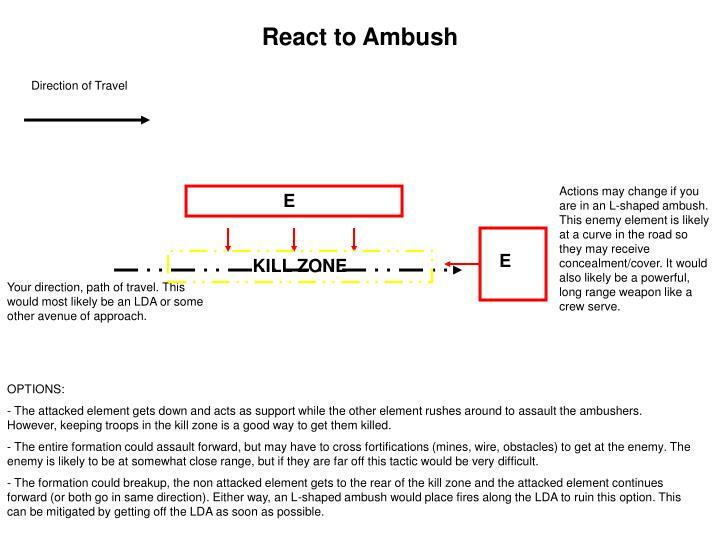 Actions may change if you are in an L-shaped ambush. 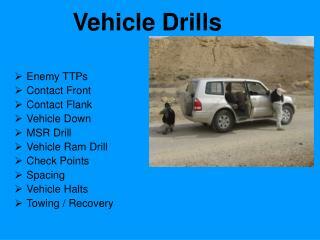 This enemy element is likely at a curve in the road so they may receive concealment/cover. It would also likely be a powerful, long range weapon like a crew serve. Your direction, path of travel. This would most likely be an LDA or some other avenue of approach. - The attacked element gets down and acts as support while the other element rushes around to assault the ambushers. However, keeping troops in the kill zone is a good way to get them killed. - The entire formation could assault forward, but may have to cross fortifications (mines, wire, obstacles) to get at the enemy. 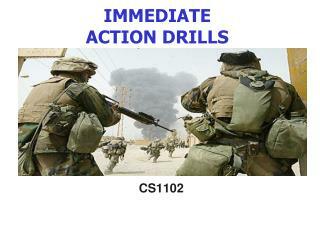 The enemy is likely to be at somewhat close range, but if they are far off this tactic would be very difficult. - The formation could breakup, the non attacked element gets to the rear of the kill zone and the attacked element continues forward (or both go in same direction). Either way, an L-shaped ambush would place fires along the LDA to ruin this option. This can be mitigated by getting off the LDA as soon as possible. 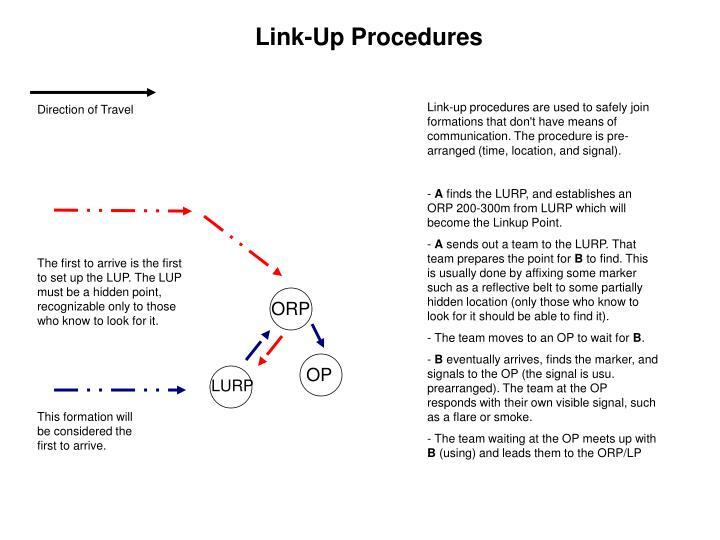 Link-up procedures are used to safely join formations that don't have means of communication. The procedure is pre-arranged (time, location, and signal). - A finds the LURP, and establishes an ORP 200-300m from LURP which will become the Linkup Point. - A sends out a team to the LURP. That team prepares the point for B to find. This is usually done by affixing some marker such as a reflective belt to some partially hidden location (only those who know to look for it should be able to find it). 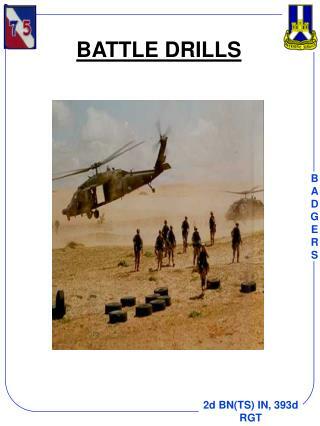 - The team moves to an OP to wait for B. - B eventually arrives, finds the marker, and signals to the OP (the signal is usu. prearranged). The team at the OP responds with their own visible signal, such as a flare or smoke. The first to arrive is the first to set up the LUP. The LUP must be a hidden point, recognizable only to those who know to look for it. This formation will be considered the first to arrive. Made by a door/entryway, remade at each step, can be done to the left or right and even at an angle, but provided that it is not in a vulnerable line from the door. Feet should be staggered to start movement more quickly. 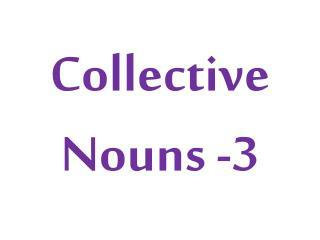 Usually conducted as an individual operation or after the assault. While one element is clearing a room, another stays outside/behind to ensure the rooms stay clear. - there are variations based on the way the door opens, the common rule is for the first to go on the easiest/straightest path. 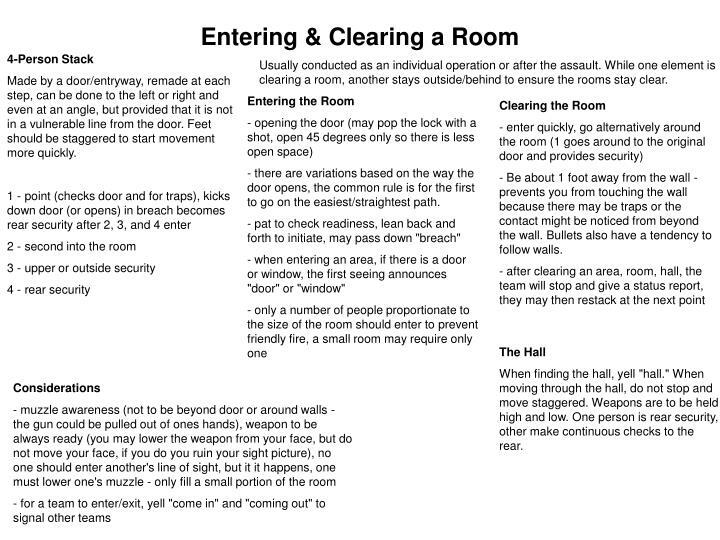 - pat to check readiness, lean back and forth to initiate, may pass down "breach"
- when entering an area, if there is a door or window, the first seeing announces "door" or "window"
- Be about 1 foot away from the wall - prevents you from touching the wall because there may be traps or the contact might be noticed from beyond the wall. Bullets also have a tendency to follow walls. When finding the hall, yell "hall." When moving through the hall, do not stop and move staggered. Weapons are to be held high and low. One person is rear security, other make continuous checks to the rear. 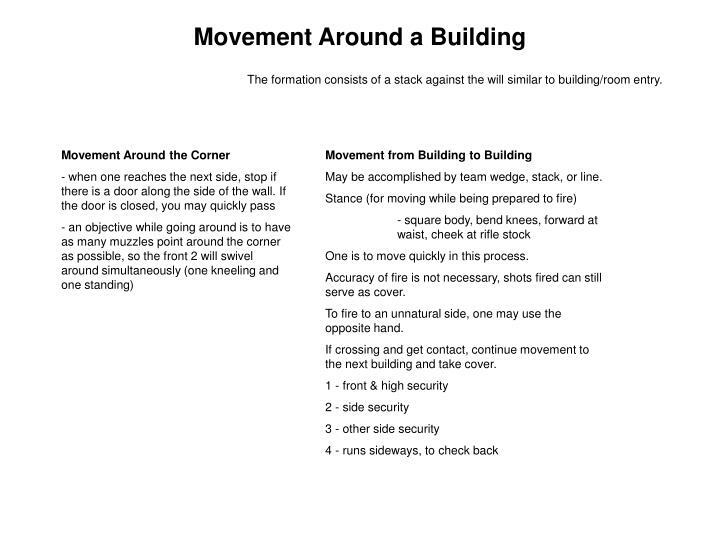 The formation consists of a stack against the will similar to building/room entry. May be accomplished by team wedge, stack, or line. 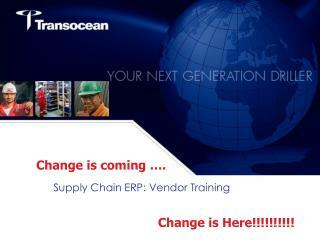 One is to move quickly in this process. Accuracy of fire is not necessary, shots fired can still serve as cover. To fire to an unnatural side, one may use the opposite hand. If crossing and get contact, continue movement to the next building and take cover. 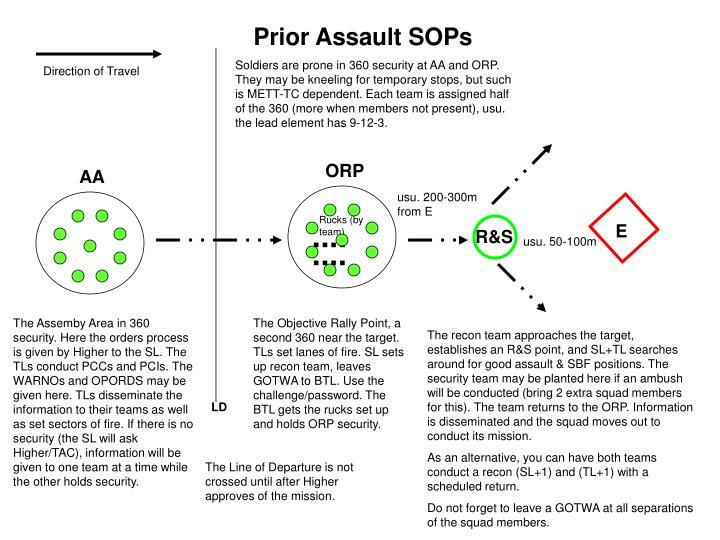 Set up Rally Points - ORP, en route, after objective, etc. Muskie Cheer -. fall 2013. how to create…. the perfect cheer squad. * accountability/integrity * hard work/dedication * support * squad cohesiveness.